Which pattern got you sewing? Every sewist has a different answer to this question. Was it something about the styling of the photographs, the fabric used, or the way the garment fits the model so perfectly that got you finally figuring out how to thread a bobbin and read a cutting layout? For me, it was Pinterest that introduced me to the Cambie dress, and the world of sewing blogging. It was about two years ago now, and at risk of sounding clichéd, my life has been changed! 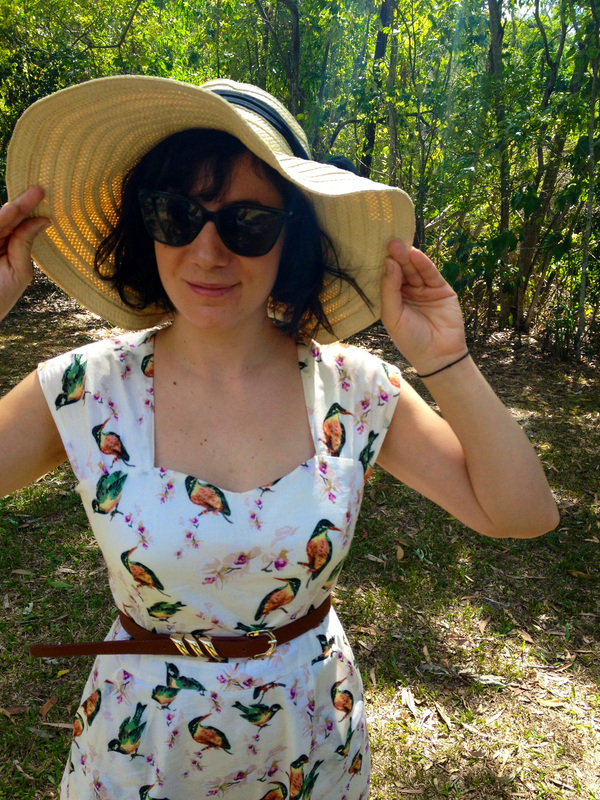 Here I am on our recent holiday in my birdie Cambie dress. This is the second dress I’d sewed on my own – and I still wear it! This is pretty rare, given almost everything I’ve sewn to date I will wear a few times after finishing and then come to realise the fit issues/fabric issues/construction issues that I should have worked out in the muslin stage. The clothes then get relegated to the closet in favour of items that don’t make me feel uncomfortable or don’t look – in my mind – too “homemade”. Because I made this dress so long ago, I’m not calling this a review of sorts (although I am in the process of writing a review on PR), but rather an ode to the Cambie, and my case for why budding dressmakers should punch in those credit card details and buy the pattern that makes them go gaga. Part of the reason I decided to dive head first into sewing was the amazing blogging community out there. The Sewaholic blog was an amazing resource when I was figuring my way through the instructions of the Cambie, and while the instructions were clear, I really did need my hand held every step of the way. The tutorials on almost every part of the construction of the dress were fantastic as I didn’t know if what I was doing was right, and I was inspired along the way by all the new versions of the Cambie popping up on the internet. I knew then I wanted to start blogging, although that didn’t happen until very recently! One day I will make another Cambie dress, knowing what I know now about how to get a better fit on the bodice given the boobage-to-waist ratio I have been gifted burdened with. I really love both versions of the dress – the full-skirted and the A-line – but I think the A-line is a winner and even something in plain black would become an instant wardrobe staple. Anyway, that’s enough from me on why the Cambie dress pattern is so awesome, and why all the budding sewists and blog lurkers out there should put their interest into action right now … today … this second! Sewing my own clothes has taught me so much about myself, both physically and intellectually, and I know I’ve found a lifelong passion I can’t believe I lived 24 years without. What about you, blogosphere? What pattern got you from the keyboard to the cutting table? Please share!